Trombonist Jimmy O'Connell has been slowly and steadily climbing the ladder of jazz success since leaving his Detroit home and arriving in New York in 2009. Over the course of his seven years in the Big Apple, O'Connell has had the opportunity to work with leading lights like trumpeter Randy Brecker and saxophonist Paquito D'Rivera, contribute to burgeoning large groups like The Revive Big Band and The Steven Feifke Big Band, and make his mark with his own Jimmy O'Connell Sixtetyes, sixtet, not sextetand a quintet that he co-leads with fellow trombonist Peter Nelson. Now, after paying his dues and putting his best foot forward for all that time, Jimmy O'Connell is stepping into the light with his first release. Arrhythmia is a debut of promise and passion. It's filled with salt of the earth jazz, neither too complicated nor lowbrow, and it delivers music that hits you straight on. Hearing this album from start to finish is basically the on-record equivalent of catching a set at New York City's Smallsa popular subterranean spot for those looking for real-deal jazz without the fancy attire, astronomical cover charge, and unnecessary accoutrements. O'Connell and company deliver an hour's worth of solid sounds here, opening with a lively take on J.J. Johnson's "Lament," closing with the soulful and low-key "Solidarity," and hitting six other stops in between. For originals there's "Gray Matter," a number that's set in motion by a four measure bass ostinato and marked by the presentation of open pathways for exploration; "Arrhythmia," a buoyant yet relaxed nod to the leader's heart condition; "(Millie) In June," a waltzing swing number that finds O'Connell and saxophonist Andrew Gould working in lyrical fashion; and "Crayons," a straight-eighth number in seven that feels perfectly natural. As for covers, O'Connell gives us an energetic trip through pianist Cedar Walton's "Bolivia" and an appropriately misty "In The Wee Small Hours." Both numbers prove to be completely in line with expectations. There's plenty of blowing room in this program, giving O'Connell, Gould, guitarist Tim Basom, pianist Tuomo Uusitalo, bassist Peter Slavov, and drummer Jimmy Macbride ample space to shine. But O'Connell doesn't sacrifice the integrity of his work to allow for that space. He's managed to showcase the strong solo personalities in his band while also crafting memorable tunes and arrangements. 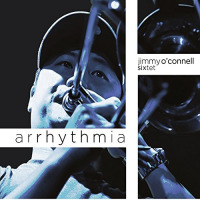 Arrhythmia is a great first step for a trombonist and composer who's likely to keep moving in the right direction. Track Listing: Lament; Gray Matter; Bolivia; Arrhythmia; In The Wee Small Hours; (Millie) In June; Crayons; Solidarity. Personnel: Jimmy O'Connell: trombone; Andrew Gould: alto saxophone, soprano saxophone; Tim Bason: guitar; Tuomo Uusitalo: piano; Peter Slavov: bass; Jimmy Macbride: drums.